Veni, Vidi, Blogi: I Came, I Saw, I Blogged: Who Loves Ya, Baby? 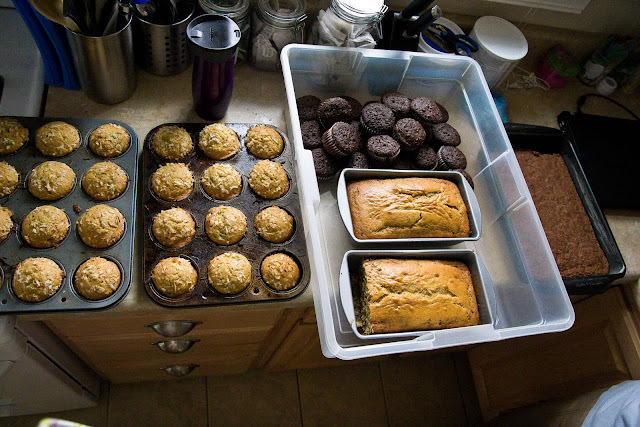 I baked boatloads of goodies. I have no idea why. It's not like Ameer can eat any of that stuff...but I just wanted to do...something. I guess I figured that normally when you have a new baby people bring by dinners, but nobody ever thinks about those snackish moments that you have at three in the morning after a feeding. And there is nothing better to fill that craving than Coconut Kiwi Muffins, Cupcakes, Cinnamon Bread and Brownies. Am I right? Anyway, I'm going to be gone for a couple of days - but when I return I'm hoping to have lots of squishy baby pictures to share with you. I'm so happy to be meeting my baby nephew! !